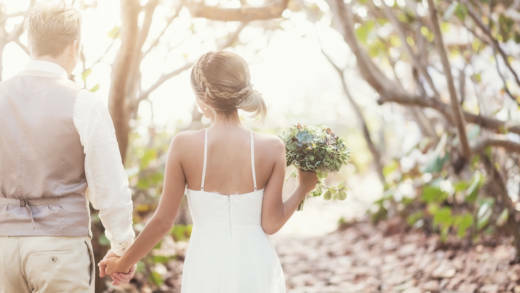 That is 74 chances to hold the perfect outdoor wedding with tolerable temperatures, low humidity and nearly no precipitation, according to Sarah Kapnick, a National Oceanic and Atmospheric Administration climate scientist and co-author of that study. She says it was inspired by frequent requests from worried friends to predict the weather on their wedding days. Of course, the odds are better if the wedding is held in generally temperate San Diego (180 mild weather days per year) rather than boggy Washington, D.C. (81 mild weather days per year). But overall, the globe is set to lose four mild weather days in the next two decades and a total of nine by the end of the century. "[That means] the summers in the United States [are] getting hotter. They're also becoming more humid, particularly in the South and Southeast," Kapnick says. Those shifts in temperature are leading to shifts in the wedding industry as bakers, photographers, florists and the couples they serve think more critically about how to beat the heat on this all-important day. "In the winter, it's actually getting warmer. And so you're having more mild weather days in the winter, and also in the shoulder seasons: spring and fall," Kapnick says. Those shoulder seasons have become increasingly popular for weddings. According to WeddingWire's annual survey of newlyweds, fewer than a third of all weddings now occur in the summer. Ten years ago, wedding dates in May, June and July were most common. But in 2017, September, October and November took the top spots. There's no conclusive evidence to suggest the shift is because of rising temperatures, but Kapnick says that the fall presents a lower risk of heat stress. "People are looking to get married often outside, often during pleasant weather where people can be active: They can be dancing, they can be enjoying themselves," she says. Though, of course, thousands of weddings still take place across the country each summer. J.P. Reynolds has been marrying couples in Southern California for more than 20 years. He says he's often the first to bake in the hot sun at an outdoor wedding, standing patiently as the entire wedding party glides down the aisle. He also gets an extended view of the misery of guests. "People look so uncomfortable. They're fanning themselves. They're squinting. They're using the programs as shades," he says. "And they're not interested in listening to someone do a reading about what is the art of marriage." Reynolds says he's adjusting to higher temperatures. He has cut down his average ceremony time by about 10 minutes and limits couples to one reading. "But I don't want the ceremony to be wham bam. There needs to be a certain texture to the ceremony," he adds. Shawna Yamamoto, a floral designer in Orange County, Calif., urges couples to choose tropical flowers for hot, outdoor weddings, which fare best in high temperatures and usually last longer. "Roses, for example, are grown in South America. The temperatures are pretty much the same year-round there, and they're a very hardy flower," she says. After flowers are chosen, it's a race to order and arrange them. "There's a standard rule that a flower should have a shelf life of seven days from the time they're cut. But that starts from the grower," explains Yamamoto. Yamamoto uses a walk-in fridge and a refrigerated truck and insulates flowers in plastic wrap. And she has more advice for couples: "Rely heavily on the professional. Be open to what's in season and what's readily available. The overall look can be achieved with different flowers." Silk flowers are also a convincing option, points out Rrivre Davies, a Los Angeles wedding designer and president of the Wedding International Professionals Association. Caterers are used to handling the heat. According to the Occupational Safety and Health Administration, temperatures can reach 110 degrees in a busy kitchen. But, Davies says, wedding caterers these days often need more air conditioning in their workstations — whether that's an indoor kitchen or an outdoor tent. And the heat can also increase costs passed onto the engaged couple. "Caterers are telling me that they're looking at the 15-day weather forecast, and if it's going to be hot, they're buying twice the ice they used to buy," Davies says. Heat can melt exterior decorations on a cake or undermine the structure. Kimberly Bailey, owner of The Butter End Cakery in Los Angeles, had to reroute the duct work in her studio to keep the decorating room cool. She and her staff have also taken to decorating with the lights off. And transporting the cake is even trickier. "We're having to coordinate timing a lot closer to when guest arrival is, and that makes it harder on our delivery schedule," Bailey says. "We don't want the cake sitting out one minute longer than it has to." She has an insulated, refrigerated van that manages "shock"— i.e. "going from an air-conditioned van to a warm environment" — by slowly warming up during transit. Then, the cake may sit for up to six hours until it is cut. "We have to take extra care to work with the event planner to ensure the cake is shielded from direct sun," Bailey says. Bakers are increasingly fielding requests from couples who ask for display-only cakes. "Some folks don't even want to take the chance. If we know it's going to be hot, they'll opt for faux tiers," Bailey explains. "The base tier will be real, and the top layers will be foam drums covered in buttercream or fondant." In those instances, the guests are served slices from a sheet cake in the kitchen. The faux cake sometimes costs more than the real thing. Davies says event designers should create stylish, covered spaces for outdoor ceremonies or receptions. "We created wooden pergola structures that we can put fabric on top of," Davies says. "We've hung misters from those or put curtains on the side." He also advises his clients to spend some extra money on air conditioning. Photographers have traditionally followed an important courtesy: Snap the young and the elderly before the rest of the wedding party. But Paul Rumohr, a wedding photographer in Los Angeles, says this courtesy has become more of a priority. "Kids have short attention spans, and in the heat, it's even crazier," Rumohr says. And heat can also affect the quality of photographs. "The better the conditions are, the more likely you are to have great photos," Rumohr says. People look better in overcast weather than in direct sun, according to Rumohr. "If the weather was better, I think people would be getting more for their money. We do the best that we can, given the conditions we have," he says. Magazines like Bride and Vogue set wedding dress trends for 2018: capes, full skirts, jumpsuits and long sleeves. All of these styles cover a lot of skin and likely retain body heat. But the dress is one part of the wedding where staying cool doesn't really matter, according to Davies. "[Dress shops] aren't seeing a big impact in what brides are choosing," he says. "When a bride has spent two or three decades thinking about what she wants to look like on her wedding day, she's not really going to be looking at the weather forecast." Most brides, Davies says, try to duck into air conditioning when they can or have a fan handy.